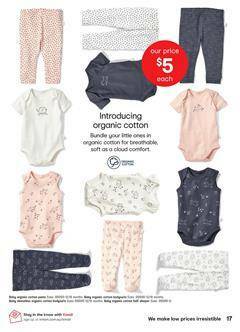 Organic cotton clothing is one of the new things from the latest Kmart Catalogue and you can find them on pg 17. Baby clothing made of organic cotton including half sleeper, bodysuits, and more that is priced at $5, can be found pg 17. Find kids' casual clothing deals on pg 18-19. Chambray shirt dress, tee, broderie dress and more are featured items on pg 18. Buy shorts, print tee, shorts, and more products on pg 19. Mix and match sale creates an alternative saving method. Kmart Catalogue sells seasonal products here. Since there are generally short sleeve tops and shorts for boys and girls. Chino and cargo shorts are on sale, too. And more casual clothing for men can also be seen on the catalogue. Browse many more products of kids category from the latest clothing sale of Kmart. Follow our Facebook page for more deals. The future Kmart Catalogues will be updated here.